I was pretty excited when the Husqvarna Nuda 900R was released in 2012—and equally disappointed when it was discontinued, following Pierer Industrie AG’s acquisition of the Italian marque a year ago. 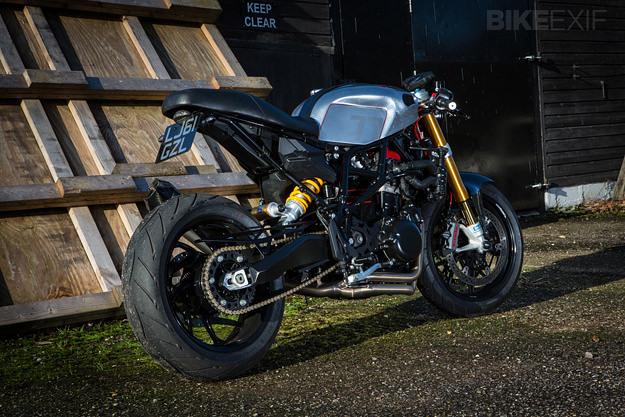 The supermoto-esque naked featured a punched out, 898cc version of the Rotax twin-cylinder mill found in BMW’s F800 series, and a tubular steel frame. 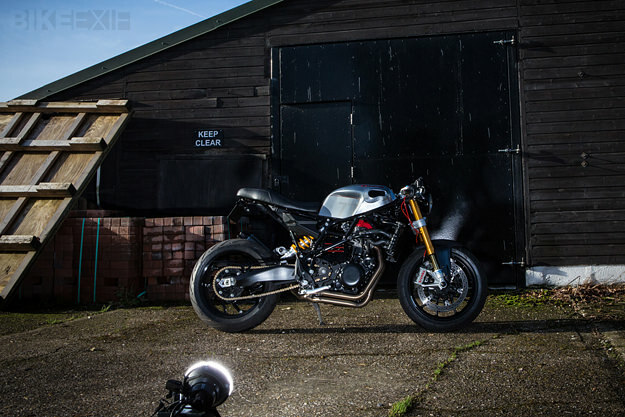 This particular Nuda belongs to Marc Woodward, an ex-motorcycle racer based in Brighton who builds café racers as a hobby. 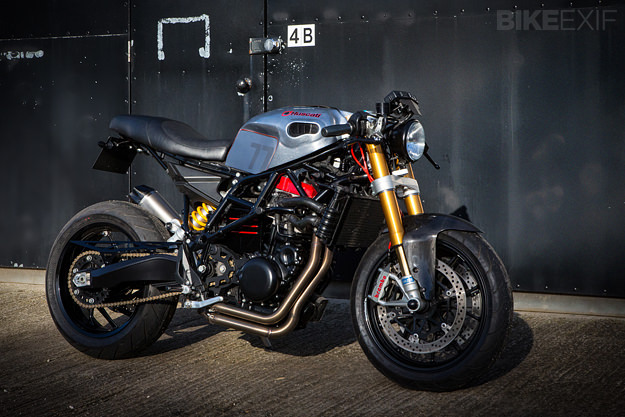 As an ex-racer, Marc says his philosophy “is to try and create café racers that handle and go as good as they look.” He takes this philosophy fairly seriously—his radically restyled Nuda now kicks out a healthy 110bhp, thanks to a full Arrow race exhaust system and a remapped ECU. It also features the front end from a Ducati 1198S, earning it the ‘Huscati’ nickname. 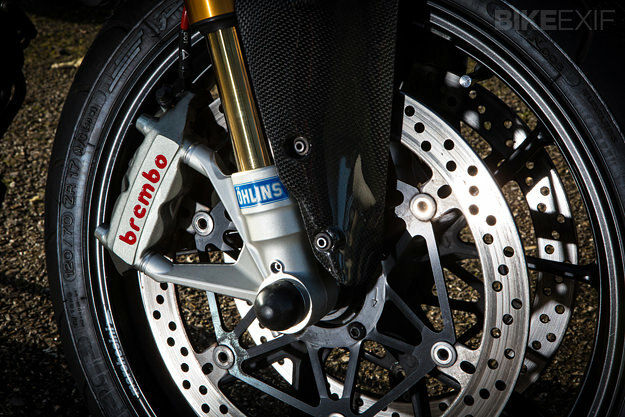 The Ducati’s Öhlins forks have been re-sleeved to fit the Nuda’s stock yokes, which have been milled to remove the original handlebar mounts. 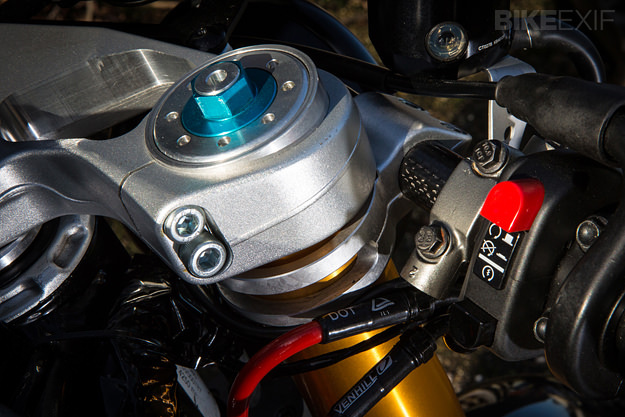 Since the Nuda came from the factory with an adjustable Öhlins rear shock, there was no need to rework the rear end. The biggest visual changes are the new tank and seat—which are both catalog items made specifically for the Husqvarna Nuda by the German parts specialist LSL, which also supplied the rearsets. The leather tank strap was hand made by Born & Bred in Brighton. Other finishing kit includes carbon fiber clip-ons, Rizoma brake reservoirs and red Venhill braided brake hoses. D-Lucks Custom Paint Workshop—another local Brighton business, and long-time Spirit of the Seventies collaborator—was responsible for the beautifully executed paint work. “The tank is a chrome metal flake with gold leaf, black and red pinstripes, and matte finish tank cut outs with shadow effect race numbers”, explains Marc, ’77’ being his old race number. Marc is, in his own words, “pretty obsessive about getting the details right” on his builds—and it shows. To my eye the ‘Huscati’ is a perfectly executed, performance-based modern retro. Wouldn’t it be good to see more Nuda-based customs in the future? Extra special thanks to Merry Michau for the images.